Nothing puts fish in the boat like live bait that are natural to the lake or body of water that you are fishing. After all, thats what the fish eat every day! Seasonal patterns, moon phases, cold fronts, barometer pressure, weather patterns, food availability, clarity of water, fishing pressure, boat traffic, water temperature, amount of oxygen in the water.... these are just a few examples that influence when a fish will eat and the size bait he will attack, on any given day, if they eat at all! I have 50 years of fishing experience. If there is one predominate factor that influences a fish to eat, and will encourage a Striper to strike, it is the presence of his natural food source, in its natural setting, presented to the fish in a natural way. In Lake Anna the Stripers main food source are Blueback Herring, Gizzard Shad and Threadfin Shad. These bait are not sold in a store, an angler must go out and catch these baits. These are the baits we use on our trips. Before one can go out and catch these baits, he must have the proper equipment to catch the baits , to hold the baits and to keep them alive for the period of time he plans to fish. Striped Bass will hit the most frantic, excited bait they can find. Your choice of bait tanks , filtration, chemicals and water temperature can make or break a Striper trip. Just look at the fish finder - see all those crazy lines? That's called "spaghetti" - that's a school of stripers going crazy for healthy bait! When Live bait fishing the bait tank is the most important piece of equipment you can have. Blueback Herring and Gizzard Shad have to be the most sensitive creatures alive. If you put them in a tank that has corners without the proper environment they will swim into the corners, push their noses into corner and use up the oxygen and die. You must have a round or oval tank that has a good circulation system to supply oxygen which also has a filtration to remove scales, ammonia buildup, and deadly organic matter to keep the water clear and the odor down. Keep your bait cool. You need to use salt to prevent slime and to harden the baits [approximately 1 cup per 15 Gallons of water]. Apply Shad Keeper or Better bait to the water to help supply electrolytes and reduce stress. Use Foam Off if foam forms on the surface of the water. Foam robs the water of oxygen transfer . Foam is an indication of poor water quality , find the reason and fix it. Never overcrowd your bait tank. 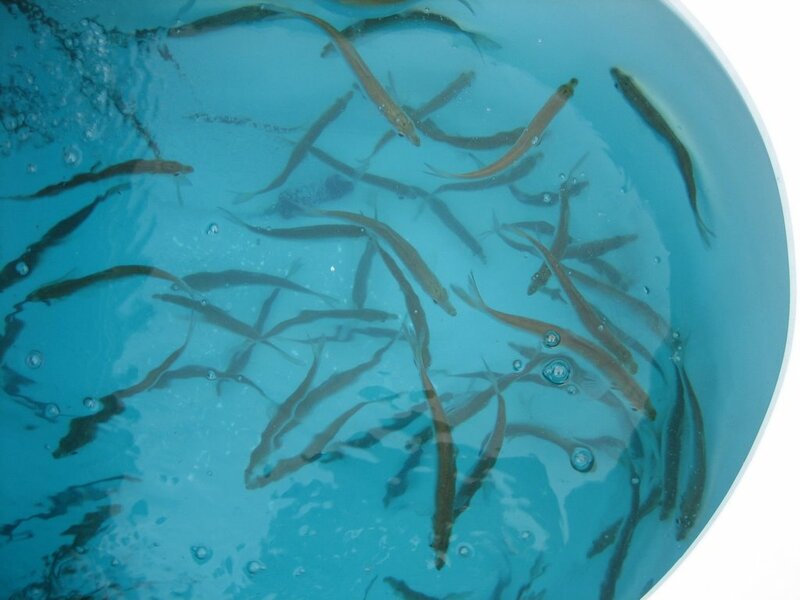 Generally speaking, to keep bait properly for a 12 hour period at its optimum level a good ratio to follow would be for Blueback Herring no more than 1.5 baits per gallon [20 gallon tank = 30 Herring] , Gizzard Shad 5 to 8 inches long 1 bait per gallon, baits 9 to 12 inches long 1 bait per 2 gallon, 12 to 15 inches 1 bait per 3 gallons of water. Less baits = Less Stress. Many factors will change the ratios, the longer you wish to keep them and the warmer the water temperature, the greater the ratios should be. Always keep you filters clean. Change half the water in the tank if you want to keep the baits in excess of 12 hours, taking care not to change the water temp by more than 10 degrees. Eliminating the stress in bait will keep the baits healthier and longer. Nothing ruins a Striper trip more than to look down into your bait tank and see your baits spinning around belly up! Assuming you know how to throw a net properly, here are a few facts that may help you collect bait better. Coverage area of a net is measured in square feet. Nets are sold by the radius, so an 8 foot net spans 16 feet across if properly thrown. As you can see, an 8 foot cast net covers about 75% more square feet than a 6 foot net. 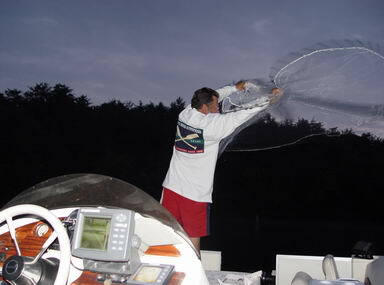 Although a 6 foot net is a good starter net, the 8 foot net will catch substantially more bait. Size alone is not the only factor in catching bait. The weight of a net [sold ½, ¾, 1,1 ¼ and 1 ½ pounds per radius foot], allows the net to sink faster . The heaver the net , the faster it sinks and less likely the bait will escape. The mesh size [ ¼, 3/8, ½, 5/8, ¾ and 1 inch ] also affects the sinking rate. The larger the mesh, the faster it sinks. The size mesh you use is determined by the size bait you are trying to catch . In Lake Anna, use 3/8 inch mesh for Threadfin shad and juvenile Herring 3 to 5 inches in length , ½ inch is perfect for adult Herring and larger mesh for the larger Gizzard shad. I personally never throw a net smaller than 8 foot and when I am catching bait deeper than 15 foot I use 10 foot nets. There are always exceptions to the rules. 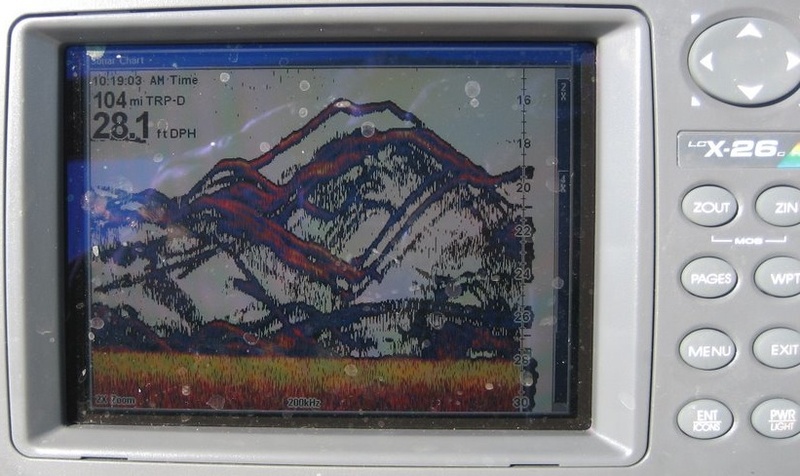 If I see a huge school of Herring on my Lowrance deep and they are balled up tight I may throw a 8 foot net so I won't catch too many at a time [a perfect catch is 30 Herring at a time, not too many whereby they knock all their scales off and stress themselves out] . On the contrary, if bait is shallow and scattered I will throw a 10 net to cover as much water as possible. If the baits are schooling on the surface and are spooky and I may need to make an exceptionally long cast I will use a smaller and lighter net to reach out and catch them. Learn to recognize your needs and adapt to the conditions. A normal Herring trip with us consists of your guide being on the water at least 2 hours before picking his clients up at daylight. We hang lights in the areas we know the Herring are using to attract the bait . After a while [hopefully within 30 to 45 minutes] the bait will gather around the light and we will throw our nets on them. In the summer months I want to start the morning off with at least 200 Herring in my tank [Many mornings we will have 200 strikes by mid morning!]. If bait collection was tough in the dark or we run out of baits before catching our limits I usually can catch more Herring in daylight hours. In the seasons when bait collection is super tough, we will catch bait the day before and store the baits in our tanks at our shop. In the seasons when we are using the larger Gizzard Shad, we usually catch bait just before and after daybreak to get us started. I prefer to start the day with about 40 big Gizz and as we run out I catch more throughout the day. We don't like to crowd the bait tanks too much. Unfortunately, sometimes we have to catch the Gizzards the day before and store them due to them being so difficult to catch. Natural Live bait indigenous to the lake are high maintenance and require a lot of time and attention. Lake Anna Striper Guide Service does whatever is possible to keep our bait healthy and frisky to ensure a successful Striper trip for you and your friends. We have over 8 bait tanks that hold over 300 gallons of water that we can store our baits in.